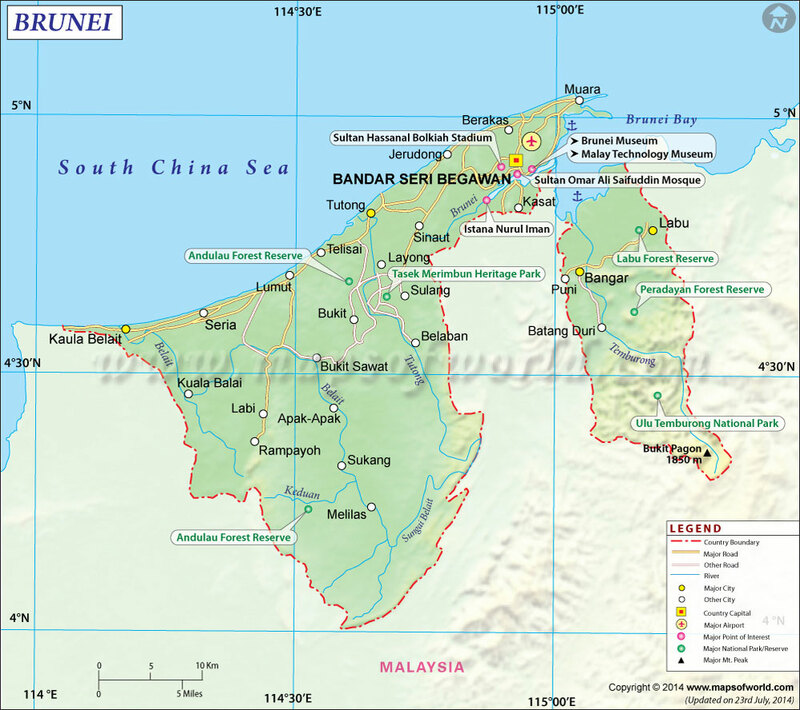 Brunei in Southeast Asia is a sovereign state located on the north coast of the island of Borneo. It is completely surrounded by the state of Sarawak, Malaysia and its coastline is with the South China Sea,also it is separated into two parts by the Sarawak district of Limbang. Officially adopted on June 30, 1911 Portugese Falg consists of two vertical stripes in green and red color with coat of arms on the boundary of the two colors at equal distance from the upper and lower edges. Brunei is a microstate on the north coast of Borneo, a Southeast Asian island, shared by Malaysia and Indonesia. The official title of the country is Nation of Brunei, the Abode of Peace. Brunei's history dates back to at least the 7th century, being ruled by various empires over time, later becoming the Islamic sultanate of Brunei. As the empire declined, it eventually came under the rule of the British, and experienced a period of Japanese occupation before gaining independence in 1984. Legend has it that its name comes from the discoverer of the land, Awang Alak Betatar of Garang – whose exclamation “Baru nah” meant “That's it,” and later evolved into Brunei. The evolution may have come about because of the Sanskrit word for the God of the ocean, “Varuna,” in a similar way to the island's name, Borneo. 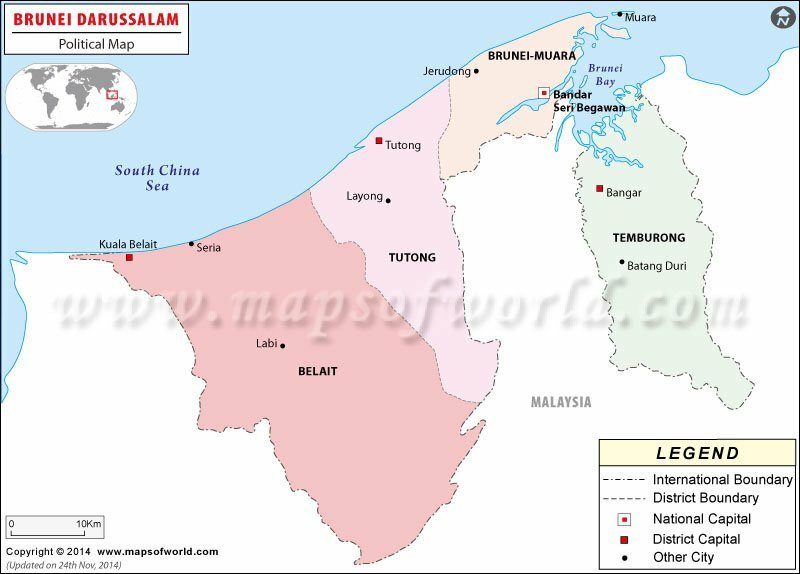 There are 4 major districts of Brunei: Belait, Tutong, Brunei-Muara, and Temburong. Brunei is bordered by the South China Sea, and otherwise completely surrounded by Sarawak, Malaysia, which actually divides the country of Brunei into two separate parts. Brunei is a small country, with an area of just 5,765 square kilometers (2,226 square miles). The major geographic features of this country are the long coastlines along the South China Sea, and the mountains of the Temburong District. Much of the land in Brunei is covered in rain forests and mangrove swamps. Along the border with Malaysia, the Pandaruan River runs, emptying into Brunei Bay. The Brunei River is a short but important river that runs along the residence of the Sultan of Brunei and serves as a main mode of transport in the area, as well as a fresh water source near the upper river. Ulu Temburong National Park is one of its greatest treasures. Accessible by boat, the park offers a Canopy Walkway, which allows visitors to experience the Batu Apoi Forest from the treetops for amazing views. Visitors to Brunei will also enjoy a visit to the Istana Nurul Iman, a palace that is home to the Sultan of Brunei, and serves as the seat of government of the country. The palace holds the record for the world's largest palace. The mosques of Brunei are also a sight to see, particularly the Sultan Omar Ali Saifuddin Mosque in Bandar Seri Begawan, which stuns with its architecture and is set along the Brunei River. Getting into Brunei is most commonly accomplished via Brunei International Airport, though ferry service allows connections to Malaysia at Brunei's main seaport, Muara. The country is fairly well connected by its road network, though parts of it are still under construction. Cars and taxis are a good option to get around, though they may be expensive. A bus system is in place in the capital, Bandar Seri Begawan, but distance buses are limited and sometimes involve transfers. Many of Brunei's cities are small enough to get around on foot or by bicycle. Brunei is the 4th most Richest Country in the World based on GDP per capita.